A small rooftop device could help produce electricity by harnessing both the sun's rays and the coldness of space at the same time. The heat of the sun can now work hand in hand with the freezing nature of space to produce energy. Researchers from Stanford University have proven for the first time the two apparent opposites can both generate energy for a unique device at the same time. 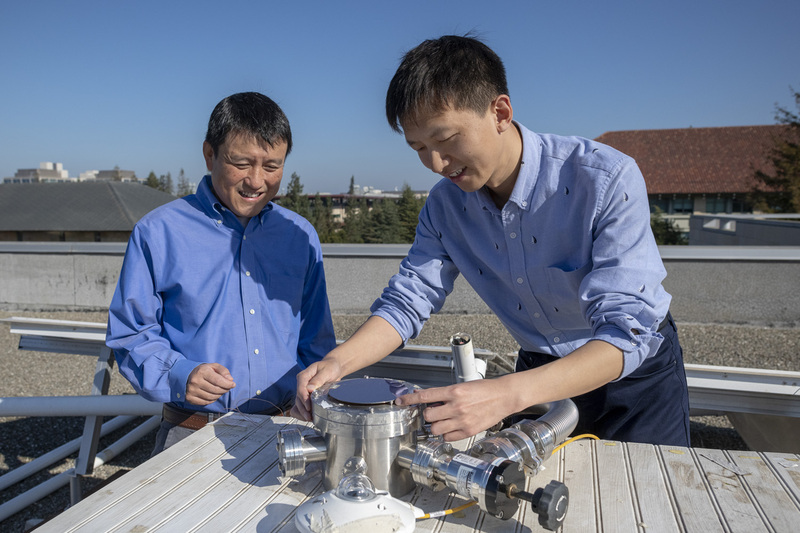 “We’ve built the first device that one day could make energy and save energy, in the same place and at the same time, by controlling two very different properties of light,” said Stanford electrical engineer Shanhui Fan, senior author. The solar energy industry has grown at a rapid pace within the last few decades. In the last decade alone, the average annual growth rate was 54 percent. Solar panel installations surged in 2016, and they're expected to keep rising due to falling costs of installation. An average-sized residential system in the US has dropped from more than $40,000 in 2010 to nearly $17,000 today, before incentives, according to the Solar Energy Industries Association. Recent utility-scale prices range from $28/MWh - $45/MWh, competitive with all other forms of energy. "It is widely recognized that the sun is a perfect heat source nature offers human beings on Earth," said Zhen Chen, the first author of the study, who is a former postdoctoral research associate at Stanford. "It is less widely recognized that nature also offers human beings outer space as a perfect heat sink." Objects radiate infrared rays -- light invisible to the human eye. A majority of this radiation goes back to Earth after being reflected by particles in the atmosphere, but some of it goes into space. This leads to surfaces that radiate within the infrared range to drop below the temperature of their surroundings. Radiative cooling technology is nowhere near as developed or advanced as solar technology, but it could provide assistance in boosting solar cell performance. Chen and Fan combined a germanium solar absorber with a radiative cooler made of silicon nitride, silicon, and aluminum. Everything was in a vacuum to prevent unwanted heat loss. They built the prototype to be the size of a pie plate and then mounted it on top of a Stanford building. They compared the temperature of the air on the rooftop to the temperature of the top and bottom layers of the device. They found that the top layer was hotter than the rooftop air, which is what they expected because it was absorbing sunlight. The bottom layer, to their excitement, was cooler than the air on the rooftop, indicating the heat radiated from the bottom of the device to the top. This technology is undoubtedly promising. However, Chen said there's plenty of work still to do before this device can be put into commercial or even governmental use. They still have to determine whether the device produces electricity. The top layer lacked the metal foil normally found in solar cells. However, that foil would've stopped the infrared light from escaping. Cost is also one of the biggest hindrances for scaling the device. The infrared window of the zinc selenide is the most costly part and requires a cheaper alternative. The solar absorber and the cooling unit also need to be replaced with cheaper materials. The Stanford team remain optimistic that it could spur a revolution in multifunctional solar technology, according to Chen. "I think this technology could potentially revolutionize the current solar cell technology," said Chen. "If our concept is demonstrated and scaled up, the future solar cell will have two functions in one: electricity and cooling."